It's a cold and misty morning on the Irish coast. The salt-water spray is stinging your eyes and you're sleep-deprived, but there is nowhere else you'd rather be. You've secured your spot as a competitor in the world-renowned Coldwater Crown fishing tournament, and you're convinced you taste victory in the salty air. You were raised on these waters. You know how and when the fish like to bite, you know which bait to use, and, most importantly, you know how to strategically balance your catch of fish to reel in the most trophies. But nothing is certain on these frigid waters. Your competitors could beat you to the best fishing spots and the fish you want could disappear just before you get there. Will you be able to bring home the Coldwater Crown or will you get left-behind in your competitors' wake? In Coldwater Crown you'll launch a plan to catch the perfect variety of fish from the Shore, River, and Lake. To catch fish, you’ll place different types of bait in four fishing zones. Using a brilliant new worker placement mechanic that lets you take actions both when you place AND when you pick-up Angler tokens, you'll begin clearing your zones, taking care to remove only bait that will help you catch the fish you need next. Whenever you clear the last piece of bait in a zone, you catch a fish corresponding to the color of the last piece of bait you cleared. You’ll also earn synergy points by clearing unique combinations of colors to catch fish in the special Master Angler Challenge. If you can catch the right fish at the right times, your trophy count will begin to stack-up, bringing victory within reach. Every trophy you haul-in earns you victory points, and the most climactic moment occurs at the very end when players submit fish from each species to win the Shore, River and Lake contests. 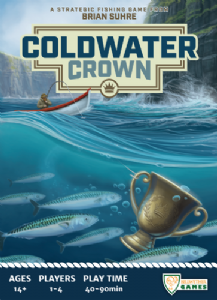 The player with the most points after all the contests are decided is declared the winner of the Coldwater Crown! For players who enjoy worker-placement games, Coldwater Crown will feel both fresh and familiar. The smooth process of placing and removing an Angler token every turn combined with the puzzle-like mechanic of setting and clearing bait from the right place at the right time is a fun and rewarding experience. Play loosely to casually explore the game, or plan your moves carefully to optimize every fish you catch and secure victory. The choice is up to you!